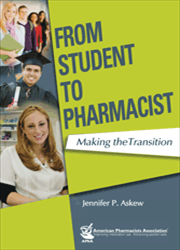 In this book, the author draws on her experience as a student, resident, hospital and community pharmacist, preceptor, supervisor, and volunteer to guide new pharmacists through actions, behaviors, and decisions that lead to a successful career. "The chapter sequencing is intuitive and the index thorough, providing useful pointers to the figures and tables scattered throughout." In addition to her own lessons learned, Askew shares the perspectives of other pharmacists, while covering key topics in the transition from student to pharmacist: obtaining board licensure, choosing a career path, preparing résumés, interviewing, handling job offers, fitting into the workplace, and achieving personal and professional success. • Guidance on gaining board licensure; narrowing down career options; preparing high-quality résumés, CVs, and portfolios; acing the job interview; thriving in the workplace; and achieving success is provided for new pharmacists. • Numerous suggested readings and resources direct readers to in-depth information on every topic. • "Day in the life" scenarios give readers a taste of various pharmacy careers. • Sample documents, tables, and figures help make concepts concrete.